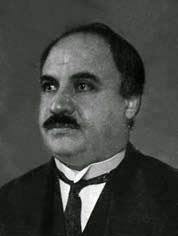 Mehmed Ziya Gökalp (23 March 1876 – 25 October 1924) was a Turkish sociologist, writer, poet, and political activist. After the 1908 Young Turk Revolution that reinstated constitutionalism in the Ottoman Empire, he adopted the pen name Gökalp ("sky hero"), which he retained for the rest of his life. 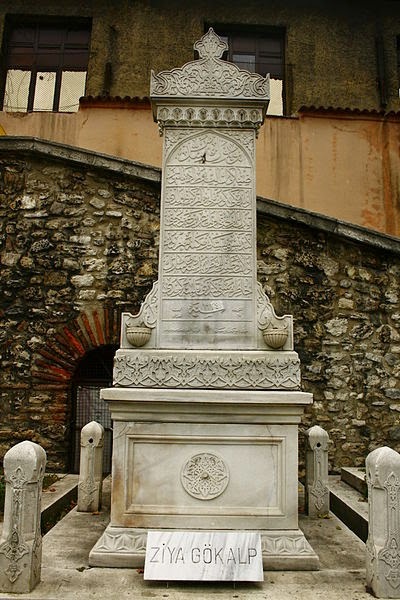 As a sociologist, Ziya Gökalp was influential in the negation of Islamism, pan-Islamism, and Ottomanism as ideological, cultural, and sociological identifiers. In a 1936 publication, sociologist Niyazi Berkes described Gökalp as "the real founder of Turkish sociology, since he was not a mere translator or interpreter of foreign sociology." Gökalp's work was particularly influential in shaping the reforms of Mustafa Kemal Atatürk; his influence figured prominently in the development of Kemalism, and its legacy in the modern Republic of Turkey. Influenced by contemporary European thought, particularly by the sociological view of Émile Durkheim, Gökalp rejected Ottomanism and Islamism in favor of Turkish nationalism. He advocated a re-Turkification of the Ottoman Empire, by promoting Turkish language and culture to all Ottoman citizenry. His thought, which popularized Pan-Turkism and Turanism, has been described as a "cult of nationalism and modernization". His nationalist ideals espoused a de-identification with Ottoman Turkey's nearby Arab neighbors, in lieu of a supernational Turkish (or pan-Turkic) identity with "a territorial Northeast-orientation to Turkic peoples". Mehmed Ziya was born in Çermik in the Diyarbekir Vilayet of the Ottoman Empire on 23 March 1876. He was of Turkmen Kurdish or Zaza descent. Diyarbakır Province was a "cultural frontier", having been ruled by Arabs and Persians until the 16th century, and featuring "conflicting national traditions" among the local populations of Turks, Kurds, and Armenians. This cultural environment has often been suggested to have informed his sense of national identity; later in his life, when political detractors suggested that he was of Kurdish extraction, Gökalp responded that while he was certain of patrilineal Turkish racial heritage, this was insignificant: "I learned through my sociological studies that nationality is based solely on upbringing." Some historians nonetheless characterize him as being of Kurdish origin. After attending secondary school in Diyarbakır, he settled in Istanbul, in 1896. There, he attended veterinary school and became involved in underground revolutionary politics, for which he served ten months in prison. He developed relationships with many figures of the revolutionary underground in this period, abandoned his veterinary studies, and became a member of the underground revolutionary group, the Society of Union and Progress. The revolutionary currents of Constantinople at the time were extremely varied; the unpopularity of the Abdul Hamid II regime had by this time awakened diverse revolutionary sentiment in Constantinople. Mehmed Ziya changed his name, initially as a pen name, to "Gökalp", meaning "Sky warrior" or "Blue warrior" in Old Turkish. Gökalp's work, in the context of the decline of the Ottoman Empire, was instrumental in the development of Turkish national identity, which he himself referred to even then as Turkishness. He believed that a nation must have a "shared consciousness" in order to survive, that "the individual becomes a genuine personality only as he becomes a genuine representative of his culture". He believed that a modern state must become homogeneous in terms of culture, religion, and national identity. This conception of national identity was augmented by his belief in the primacy of Turkishness, as a unifying virtue. In a 1911 article, he suggested that "Turks are the 'supermen' imagined by the German philosopher Nietzsche". His major sociological work was interested in differentiating Avrupalılık ("Europeanism", the mimicking of Western societies) and Modernlik ("Modernity", taking initiative); he was interested in Japan as a model in this, for what he perceived to be its having modernized without abandoning its innate cultural identity. Gökalp suggested that to subordinate "culture" (non-utilitarianism, altruism, public-spiritedness) to "civilization" (utilitarianism, egoism, individualism) was to doom a state to decline: "civilization destroyed societal solidarity and morality". Informed by his reading of Émile Durkheim, Gökalp concluded that Western liberalism, as a social system, was inferior to solidarism, because liberalism encouraged individualism, which in turn diminished the integrity of the state. Durkheim, whose work Gökalp himself translated into Turkish, perceived religion as a means of unifying a population socially, and even "religion as society's worship of itself". Durkheim's assertion that the life of the group was more important than the life of the individual, this was a concept readily adopted by Gökalp. A well-known newspaper columnist and political figure, Gökalp was a primary ideologue of the Committee of Union and Progress. His views of "nation", and the ways in which they have informed the development of the modern Turkish state, have made for a controversial legacy. Many historians and sociologists have suggested that his brand of nationalism contributed to the Armenian Genocide. His conception of nation was of a "social solidarity" that necessitated "cultural unity". "Geographic nationalism", in which everyone living under one political system was a part of the nation, was unacceptable to Gökalp, who conceived of a nation as linguistically and culturally unified. Finally, merely to believe one was a part of a nation, this was not enough, either; one cannot choose to belong to the nation, in his view, as membership in the nation is involuntary. After World War I, he was arrested for his involvement in the Committee of Union and Progress, and briefly exiled from the country to Malta. While exiled on Malta, he continued to write and consolidate his ideas and drafted his Principles of Turkism published in 1923. He returned to Turkey in the spring of 1921, but was not given back his chair at the University of Istanbul. He settled in his hometown of Diyarbakir where he taught sociology and psychology at a secondary school and teacher's seminary. He began publishing a small weekly newsletter, Kucuk Mecmua, which slowly became influential and lead to contributions in the major daily newspapers of Istanbul and Ankara. At the end of 1922, Gökalp was invited to direct the department of publication and translation at the Ministry of Education. He was selected to serve on the second Grand National Assembly until his death 1924, during which he served on the Committee for Education which reformed the school system, curriculum and textbooks. Additionally he participated in the drafting of the 1924 constitution. In addition to his sociological and political career, Gökalp was also a prolific poet. His poetic work served to complement and popularize his sociological and nationalist views. In style and content, it revived a sense of pre-Islamic Turkish identity. The protagonist in his Kızılelma, the "ideal woman", suggests: "The people is like a garden, / we are supposed to be its gardeners! / First the bad shoots are to be cut / and then the scion is to be grafted." She is the teacher at Yeni Hayat ("New Life"), where Eastern and Western ideals meet and form a "new Turkish World". His poetry departs from his more serious sociological works, though it too harnesses nationalist sentiment: "Run, take the standard and let it be planted once again in Plevna / Night and day, let the waters of the Danube run red with blood...." Perhaps his most famous poem was his 1911 Turan, which served to compliment his Turanist intellectual output: "For the Turks, Fatherland means neither Turkey, nor Turkestan; Fatherland is a large and eternal country--Turan!" During the First World War, his Kızıl Destan ("Red Epic") called for destroying Russia in the interest of pan-Turkism. His 1923 The Principles of Turkism, published just a year prior to his death, outlines the expansive nationalist identity he had long popularized in his teachings and poetry. The nationalism he espouses entails "a nation that is not a racial or ethnic or geographic or political or volitional group but one composed of individuals who share a common language, religion, morality, and aesthetics, that is to say, who have received the same education." more distant, Turkic-speaking peoples, such as the Yakuts, Kirghiz, Uzbeks, Kipchaks and Tatars, possessed of a traditional linguistic and ethnic unity, having affinity—but not identity—with the Turkish culture. The second stage was "Oghuzism", and the final stage would be the "Turanism" that he and other nationalist poets had been promoting since before World War I. While this broad conception of "Turkishness", of pan-Turkism, often embraced what Gökalp perceived to be ethnic commonality, he did not disparage other races, as some of his pan-Turkist successors later did. Gökalp has been characterized as "the father of Turkish nationalism", and even "the Grand Master of Turkism". His thought figured prominently in the political landscape of the Republic of Turkey, which emerged from the ruins of the Ottoman Empire around the time of his death. His influence resonated in diverse ways. For instance, his Principles of Turkism had contended that Ottoman classical music was Byzantine in origin; this led to the state briefly banning Ottoman classical music from the radio in the 1930s, because Turkish folk music alone "represented the genius of the nation". For popularizing pan-Turkism and Turanism, Gökalp has been viewed alternately as being racist and expansionist, and anti-racist and anti-expansionist. These opposite readings of his legacy are not easily divisible into proponents and detractors, as racist and fascist elements in Turkey (such as the "Nationalist Action Party") have appropriated his work to contend that he supported a physical realization of Turanism, rather than a mere ideological pan-Turkist kinship. Some readings of Gökalp contend, to the contrary, that his Turanism and pan-Turkism were linguistic and cultural models, ideals from which a post-Ottoman identity could be derived, rather than a militant call for the physical expansion of the Republic of Turkey. Guenter Lewy writes that "practically all interpreters of Gökalp's thought stress that his notion of Turan or Turanism did not involve any expansionist plans". For espousing a "homogeneous nation" and rejecting minority rights and minority identity, Gökalp has often been associated with the Armenian Genocide. Historian James Reid has asserted that "What Wagner was to Hitler, Gökalp was to Enver Pasha." Gökalp's writing has more recently figured in nationalist discourse in regards to Turkey's Kurdish minority. Turkish nationalist academics have cited Gökalp in contending "there is no such thing as the Kurdish people". Although he often held quite different ideas, Arab nationalist Sati al-Husri was profoundly influenced by Gökalp.